Maggie's Movies - Camera, Action! Game Review - Download and Play Free on iOS and Android! 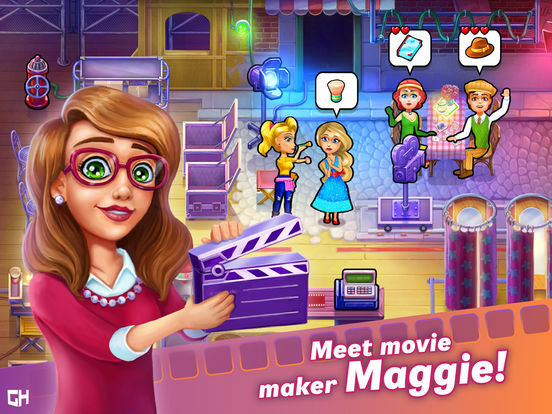 Home » Mobile Games » Maggie's Movies - Camera, Action! Pleasant twist from the usual Time Management format. Plenty going on at all times. It's a fairly typical Time Management game at heart. Live out your dreams as a vital part of the movie industry! Maggie's a young woman whose family history is full of cinematic joy. Practically growing up in her grandfather's movie theater, she'd watch every movie she could get hold of. Such a childhood has left her keen to pursue her dream of making it big in the movie industry. Maggie's Movies has you following that dream, while putting in the hard work to keep directors and picky corporate types happy. Serve customers as quickly as possible. Bring them costumes, makeup, scripts, and many more other tools. Upgrade furnishings and watch as your skills grow. Chain combos by serving people most effectively. Maggie has plenty to do at all times meaning you need to keep moving. Juggling multiple different tasks at once is all in a day's work for an aspiring star. There's always something new to do with plenty of satisfaction to be gained when you do so quickly. Retrieve important items for them. Choose good camera angles and lighting for the shot. Find optional extras like mice and script notes. Maggie's Movies offers 60 levels divided across six themed sections. As you work your way through them, you gain more and more influence in the movie making process. Alongside that is a series of cutscenes to highlight Maggie's struggle as she aims to accomplish her dreams, consistently reporting back to her beloved grandfather so he knows how things are going. It's a real tale of rags to riches. Working your way up within the movie industry isn't an easy task. It's a fantastic thing to aspire to and something many of us dream of, but it's not easy by any means. Usually involving many years of hard work and hoping for a break, it's frequently a matter of plenty of busywork. That's why the idea of making a Time Management game based around it makes perfect sense. Maggie's Movies is that game. It's going to be extremely familiar to fans of the genre and borrows quite liberally from other well known titles, but it certainly makes a pleasant change to enjoy a new twist. Maggie's Movies eases you in quite gently. At the start, you're introduced to the key elements of what's going on. Essentially, you have to keep everyone on set happy. This is done through a variety of ways but interaction always remains the same. You tap on where Maggie needs to go, she picks up an item, possibly combines it with something else, then moves onto the next thing. It's a simple process and one that many players will recognise. For that reason, you'll soon understand what to do in Maggie's Movies. Keeping everyone happy is a busy endeavour, though, as well as somewhat never ending. Some cast members might simply want some food, while another might require a change of clothing or a specific prop for their role while filming. Your mission is to keep on top of all of this. It's unforgiving work in a way, almost reminiscent of what an intern really goes through, but Maggie's Movies ensures there's a steady stream of rewards coming your way. For instance, you unlock new outfits and items as you play. When the box pops up to show you what you've accomplished, it's hard not to feel a teensy bit good about yourself. Maggie's Movies backs that up with a series of achievements too. Some are simple such as preparing an order before someone has asked it of you, while others are a matter of longevity, with you simply completing many tasks in a row. By working towards being at your most efficient, you gain multiple advantages. You can upgrade your surroundings giving you bonuses such as better tips or providing you with some more patient customers. There are side objectives too, giving you further reason to keep an eye on exactly what's going on. In typical Time Management game fashion, you're rewarded up to three stars for completing a level. Speed and efficiency is key to gaining those three stars. Crucially, accruing combos by combining the same type of work in a row makes a big difference. Ideally, you want to take everyone's money at once, for instance. It'll save you time thereby keeping customers happy, plus you'll gain a combo multiplier for doing it this way. 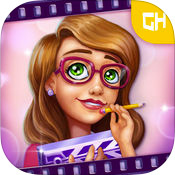 That means Maggie's Movies is really quite strategic in its approach at times, even if the best strategy is the kind of thing you'd use in other Time Management games. It's the change of theme and setting that's likely to endear you to it most of all. There's a storyline tied into everything that unfolds, but it's not hugely gripping. It's a fairly cliched tale of Maggie struggling along while occasionally lamenting what's going on. You can probably guess how it's going to end but then who plays a Time Management game for gruelling realism? For a game that should really be far too familiar, Maggie's Movies feels like a small breath of fresh air. That's mostly down to its theme. Doing something other than simply running a restaurant makes a pleasant change. While you might be mostly completing the same kind of tasks as before, the change in setting gives you a sense of achieving something different in your virtual life. Consistently having so many new things to unlock, such as outfits, props, or simply achievements, ensures you'll feel as if there's always something new to play towards. 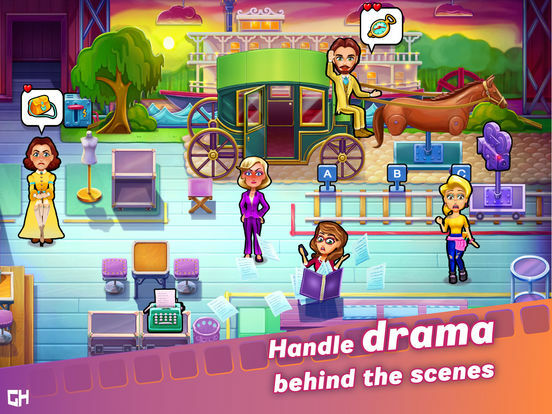 That alone means that Maggie's Movies is plenty of fun and sure to entice new and old fans of Time Management gaming.